Just like American society is divided among Pro and Anti-Trump groups, this week UPSC aspirants community is divided between Pro vs Anti Guessmasters after the completion of Prelims 2017 [at least it seems so, from the fierce debates and comment wars everywhere on answerkeys]. So for my own curiosity, I’ll simultenously check, to what extend one could apply guessmater-giri in UPSC Prelim 2017, while preparing the answerkey for the same. 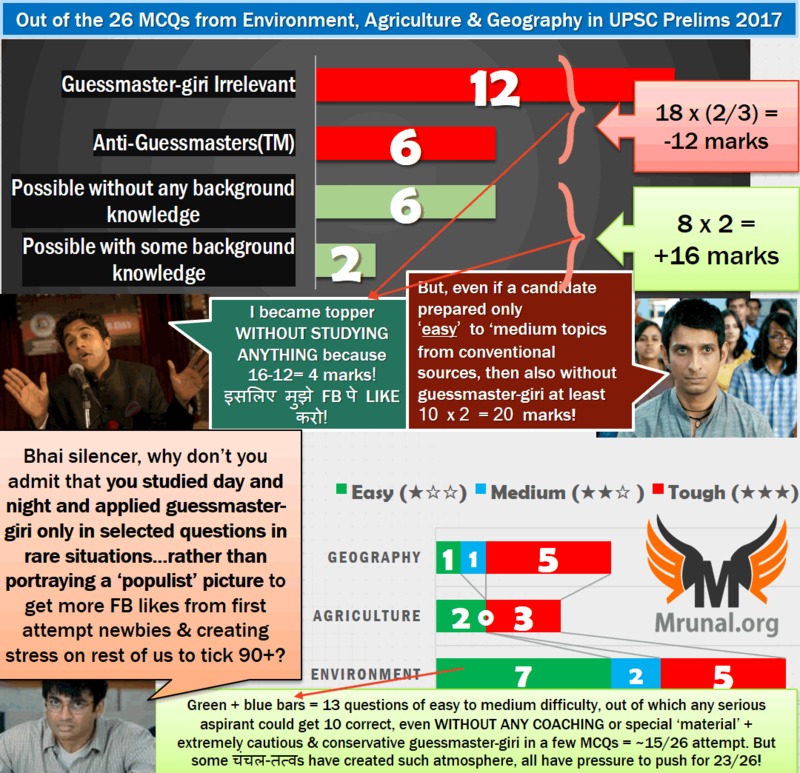 While sometimes intelligent guess and intelligent elimination are necessary in UPSC, but this ‘ guessmaster-giri movement’ and its bragging on social media by some चंचल-तत्वs for populism and FB-likes, has reached to such pathological level that a gullible newbie might be sucked into falsely believing that UPSC prelims requires no preparation AT ALL and only by hawaabaazi you can become IAS! Ofcourse, prelim-2017 candidates, would have learned the hard way that when UPSC examiner gets into mood, he can set tough papers to teach lesson to whomever he wishes to teach lesson to. But after one year, it entire episode will fade from memory and public debate, then again, the first attempt aspirants will again fall prey to the preaching of the चंचल-तत्वs. So this assessment must be done and kept in public domain. Ever since the merger of forest service prelims with Indian civil services, UPSC had been devoting about 1/5th of the paper to environment, biodiversity, agriculture related topics. That prem has now shifted towards polity, economy and Government scheme related topics. While environment reduced to just 14 MCQs. Minimum 1-2 MCQs would be from India yearbook’s chapter 11 on environment. They would ask low profile international environment orgnizations and funds such as Biocarbon fund, Forest carbon facility, birdlife international, TEEB, etc. Prem continues: CCAC, GCCA and TRAFFIC asked. But TRAFFIC given verbatim in Shankar’s book, so, only 2 tough MCQs from “about us” pages of random bodies. Earlier this used to be a bigger number. International treaties related questions asked be it INDC of Paris Summit, UN desertification convention, agenda 21 of RIO+20 and so on. Special affection to marine / riverine flora-fauna: dolphin, dugong, ghariyal. Ghariyal-Prem resurfaces and intensifies- in two MCQs this time! Where will you find hornbill in its natural habitat? Same question, but for Ghariyal. State butterfly asked What would happen if all butterflies die? MCQs on environmental R&D – especially those related to pollution and clean energy such as fuel cell, biotoilets etc. But nothing from this segment in 2016. Prem resurfaces: three questions 1) bioremediation 2) algae fuel 3) carbon sequester. Current Affairs Span: September 2016, when it appeared in Indian express. 45. Recently there was a proposal to translocate some of the lions from their natural habitat in Gujarat to which one of the following sites ? Answer given verbatim in Mrunal’s article three years ago. Though I don’t claim it under my bogus marketing propagandaTM because such trivial thing difficult to memorize from such new users would not have even seen! Current Affairs Span: As such three years old news. But again kept flashing in December 2016 and January 2017 because of SC appointed Committee’s remarks. 41. In India, if a species of tortoise is declared protected under Schedule I of the Wildlife (Protection) Act, 1972, what does it imply ? (a) It enjoys the same level of protection as the tiger. (b) It no longer exists in the wild, a few individuals are under captive protection; and now it is impossible to prevent its extinction. (c) It is endemic to a particular region of India. (d) Both (b) and (c) stated above are correct in this context. Tiger is given as Schedule I animal. So “A” is correct. Thankfully it’s not a 3TF question (three statements true / false like ‘only 1 and 2 correct | only 1 and 3 | all correct), else it’d have been difficult. 60. According to the Wildlife (Protection) Act, 1972, which of the following animals cannot be hunted by any person except under some provisions provided by law? Mrunal’s L8 Lecture for Green Law Panel that schedule 5 vermin- crow, fruitbat, mice and rat can be killed. Since the animals given in above MCQ are outside that’ Venn Diagram’, so by deduction, the answer is “D”. Though I don’t claim it under my bogus marketing propaganda because most candidates don’t go through Green law panel report being an ‘out of public news’ topic. Another source: ShankarIAS Environment Book Page 180. 17. If you want to see gharials in their natural habitat, which one of the following is the best place to visit? 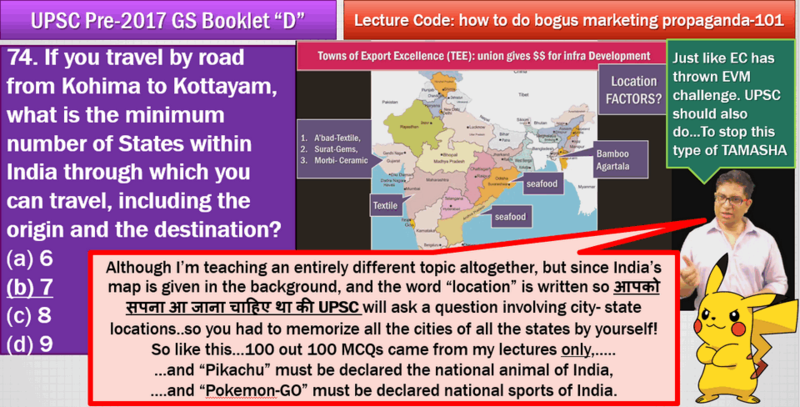 Ok it seems now UPSC examiner’s pathological obsession has shifted from Diclofenac-Vultures to Gharials. But again, ShankarIAS Environment Book comes to rescue: Page 135 mentions that Gharials are river dwelling fish-eaters and their only viable population is in the Chambal Sanctuary. So “B” should be the answer. 79. From the ecological point of view, which one of the following assumes importance in being a good link between the Eastern Ghats and the Western Ghats? Page 17: The Eastern and Western Ghats Meet at Nilgiri hills. Page 16: Nilgiri hills are in Karnataka and Tamilnadu. Nallamala Forest It’s in Eastern Ghat India: Physical geography Class 11, page 17. Second statement is correct because verbatim given. 96. Due to some reasons, if there is a huge fall in the population of species of butterflies, what could be its likely consequence/consequences? Statement 1 is right (by common knowledge) but for the sake of reference- NCERT Class 12 biology page 30! This eliminates “B”. Second statement should be wrong because of the extreme word “drastic“. This eliminates “D”. Besides I’m unable to find any specific reference that mentions linkage between butterfly population vs fungus infection. Birds and spiders tend to prey on butterflies (by common knowledge) but again for sake of reference: this google book, so statement 3 is a possible outcome. Hence answer “C”: 1 and 3 only. Difficulty: ★☆☆ [Easy to medium, depending on gut feeling vs the courage to act upon that gut feeling. Guessmaster-giri possible]. Another source: ShankarIAS Environment Book Page 59. 89. In the context of solving pollution problems, what is/are the advantage/advantages of bioremediation technique? It is a technique for cleaning up pollution by enhancing the same biodegradation process that occurs in nature. Any contaminant with heavy metals such as cadmium and lead can be readily and completely treated by bioremediation using microorganisms. Genetic engineering can be used to create microorganisms specifically designed for bioremediation. While as such NCERT Class 12 Biology Chapter 12: Biotechnology application and NIOS Page 128 mention the term bioremediation but the specific details asked here, are not given. Page 71: In-Situ Bioremediation techniques: subtopic- Biosparging- It is the injection of air under pressure below the water table to enhance the rate of biological degradation of contaminants by naturally occurring bacteria. Hence statement 1 is right. Page 72 talks about genetic engineering approaches to bioremediation. Hence 3 is also right. Page 72: Subtopic- Disadvantages of bioremediation – not all compounds are susceptible to rapid and complete biodegradation, and bioremediation often takes longer time than other treatment processes. So, second statement unlikely to be correct. Hence, answer “C” 1 and 3 only. 100. In the context of mitigating the impending global warming due to anthropogenic emissions of carbon dioxide, which of the following can be the potential sites for carbon sequestration? Natural sinks- ocean, forest, soil etc. Artificial sink- depleted oil reserve, unminable mines. So statement 1 and 2 are correct. And this google book claims Deep Saline Formations infact have highest capacity for this. So accordingly, answer is “D”. Difficulty: ★★★ [Tough, even after reading Shankar’s book you’re left with 50:50 between A and D. Third statement is factual, so guessmaster-giri irrelevant. because, you can’t correctly predict how CO2 would be reacting to saline formations, unless you’ve done detailed study of chemistry. And if you’ve studied chemistry in detail, then there is no need for guessmaster-giri in the first place! 97. It is possible to produce algae based biofuels, but what is/are the likely limitation(s) of developing countries in promoting this industry? Production of algae based biofuels is possible in seas only and not on continents. Setting up and engineering the algae based biofuel production requires high level of expertise/technology until the construction is completed. Economically viable production necessitates the setting up of large scale facilities which may raise ecological and social concerns. Page 61: Open Algal ponds will attract insect larvae invasion and affect predator-prey balance. This is ecological concern. Hence Statement 3 is right. Page 31: discusses the challenges in the choice of algae strains for biomass production, the technology to be used for fuel production, the source, and the type of cultivation facility (open versus closed). All this proves statement #2 is right. Hence answer 2 and 3. Difficulty: ★★☆ [Easy to Medium depending on your wide reading on such topics in theHindu. By Guessmaster-giri statement 1 ought to be wrong because it has extreme word “only”, but still we are left with 50:50 between B and C. but what after that? Even statement #2 can be said an ‘extreme’ statement because it has two extreme words 1) high expertise 2) no need of high expertise once construction is over, even a Bihar board exam Topper can operate the system! So then second statement ought to be wrong because of the extreme words! Then you’ll wrongly arrive at answer “C”: 3 only. Hence this is Anti-guessmastersTM MCQ. 2. With reference to ‘Global Climate Change Alliance’, which of the following statements is/are correct? 1. It is an initiative of the European Union. 2. It provides technical and financial support to targeted developing countries to integrate climate change into their development policies and budgets. 3. It is coordinated by World Resources Institute (WRI) and World Business Council for Sustainable Development (WBCSD). EuropeAid (DG for International Cooperation and Development) drives and oversees the overall implementation of the GCCA. So third statement is wrong. By elimination we are left with “A”. by logic that IF EU is behind this alliance, then some other group (WRI, WBCDS) could not be running it and vice versa, still you’re left with 50:50 between “A” and “C”. 1. Climate and Clean Air Coalition (CCAC) to reduce Short Lived Climate Pollutants is a unique initiative of G20 group of countries. 2. The CCAC focuses on methane, black carbon and hydrofluorocarbons. CCAC was formed in 2012 by UNEP and Ghana, Bangladesh etc. countries. So first statement is wrong. Second statement is right- they focus on Short Lived Climate Pollutants such as methane, black carbon and hydrofluorocarbons. Difficulty: ★★★ [Tough, difficult to memorize and recall 50 dozen such international environment organizations’ about us pages. Anyways, UPSC examiner puts such “about us” page questions not with the primary desire of getting correct answer from the candidate, but rather to throw him off his balance so he makes silly mistakes in other easy questions. If you count ‘unique’ as an extreme word with G20 then first statement is wrong. Second statement is factual with no extreme words like “only” so it ought to be right. Hence answer “B”. Current Affairs Span: formed in 2012, and hosted some side event in UNFCCC’s Marrakech summit 2016. but in such summits 50 dozens entities participate and do side shows! 2015: EVEN when Modi had launched good number of schemes, still UPSC continued asking schemes from Rajiv-Indira times’ such as accelerated irrigation benefit scheme, command area development etc. Pro-congi examiners from have been replaced. And it’s a blessing for the aspirants- henceforth no old schemes need to be prepared. Otherwise India Yearbook it still full of them. Shifting from Wooden plough to steel plough? How to do water conservation? Urea fascination continues: Earlier they asked (2015) impact of excessive nitrogen fertilizer use then (2016) How neem coating of urea helps in cultivation? Now (2017) soil health card benefit? 2013: 1) Mycorrhizal biotech, 2) examples of biofertilizers. A soil health card provides information about 12 soil parameters, so farmer can use appropriate fertilizers. hence only 3 is the correct statement. Statement 1 and 2 are irrelevant. Current Affairs Span: Budget speech 2014 when the concept was mentioned. Although actual implementation started from 2015. 58. What is/are the advantage/advantages of implementing the ‘National Agriculture Market’ (NAM) scheme? Current Affairs Span: Budget speech 2014 when the concept was mentioned, however only in April 2016 the pilot project was launched in 8 states. Hence we are left with answer “D”. Counter argument: same FAO manual also says that tillage helps in better water penetration by increasing the surface area and porosity of the soil. So statement#1 is wrong? But then there is no option saying “only 2 and 3”, besides this Hindu article says zero tillage faming helps in moisture conservation. So 1, 2 and 3 are correct. It still boils down to what impact would gypsum have on irrigating the field? So you’ll be caught among three options B, C and D.
And if you apply the traditional science knowledge of ‘absorption’ (more surface area = more absorption), then statement 1 ought to be wrong. Then you may wrongly conclude the final answer is “B” only 3. Basically, this is an Anti-guessmastersTM MCQ. 28. What is the application of Somatic Cell Nuclear Transfer (SCNT) Technology? Over the years, theHindu has been running news of cloning of buffalos by Somatic Cell technology. (For example this news in Jan 2016). So, “C” should be the answer. Britannica confirms that SCNT technology was used for cloning the sheep “Dolly”. Difficulty: ★★★ tough if you’ve never heard the term before, because by guessmaster-giri (b) ought to be wrong because it’s non-living plastic. Still, you’ll be caught between A, C and D. NCERT biology (Class 12) mentions about somatic hybridization, so that may even prompt you to wrongly arrive at “A”. Basically this is an Anti-guessmastersTM MCQ. 70. With reference to agriculture in India, how can the technique of ‘genome sequencing’, often seen in the news, be used in the immediate future? NCERT Class 12 Biology Chapter 6: “Molecular Basis of Inheritance”. So on that logic, statement 1 and 3 should be possible, and if 1 and 3 are possible then statement 2 ought to be possible as well! So answer D- all three statements are correct. Statement #1 is right by this google book. Difficulty: ★★★ Tough. While it may seem easy by guessmaster-giri and gut-feeling outside the examhall, but in past there have been tricky MCQs from genetic engineering topic, especially because second statement is in a way ‘extreme worded statement‘ [Genome sequencing is a very time consuming process so if examiner says in the ‘present tense’ that it helps in faster creation of new varieties, and guessmastergiri’s first rule says extreme worded statements ought to be “WRONG” but then you’d be 50:50 between “A” and “C” but since both of those options are wrong so it’s an Anti-guessmastersTM MCQ. Geography can be divided into three parts 1) India 2) World 3) Physical. Increased to 7, but mostly tough so even getting 4 correct is an accomplishment! When UPSC revamped Mains syllabus in 2013, for the initial two years Geography segment in GS Mains paper1 would be very tough- optional subject level of knowledge required. But gradually they did ‘ease of doing business’ there, but now part of that prem (of optional subject level toughness) has now shifted to prelim geography. Low profile tributaries of famous rivers asked e.g. Godavari, Bramhaputra in 2015 and 2016 respectively. MCQ on low profile Teesta river along with its low profile tributary- Rangeet. 2016 did not have many variety of MCQs from geography but earlier they used to ask multiple types of MCQs e.g. map based ‘factors’ affecting climate etc. tribal group vs. state where they live. 6 out of 7 MCQs are map based or location based only! And hence the geography section is tough, because every year, max. 2 MCQs would be from map in prelims. And in Mains, the Map based GK is not directly asked in GS Mains papers (unlike Optional Geography paper, directly 10-20 marks worth places asked). So non-geography optional students tend to take map study casually. So they’ll find 2017’s Geography MCQs challenging. 2015: Which of this does not open out to the Mediterranean Sea? (d) lsrael Prem resurfaces: Mediterranean Sea is a border of which of the following countries? 16. With reference to ‘Indian Ocean Dipole (IOD)’ sometimes mentioned in the news while forecasting Indian monsoon, which of the following statements is/are correct? 1. IOD phenomenon is characterized by a difference in sea surface temperature between tropical Western Indian Ocean and tropical Eastern Pacific Ocean. 2. An IOD phenomenon can influence an El Nino’s impact on the monsoon. TheHindu: Indian Ocean Dipole (IOD) is an event which the western Indian Ocean becomes alternately warmer and then colder than the eastern part of the Indian ocean. So first statement is wrong. A positive IOD leads to greater monsoon rainfall and more active (above normal rainfall) monsoon days while negative IOD leads to less rainfall and more monsoon break days (no rainfall). So yes, IOD can influence El Nino’s impact on Monsoon. So second statement is right. Difficulty: ★★☆ [Medium to tough for non-geography optional students. Because most of the geography books confine themselves to El Nino, Southern Oscillation, Tibet plateau heating, jet stream and ITCZ. IOD rarely gets focus. And, Even if you apply guessmaster-giri that Indian ocean diople has word “India” so it ought to be unassociated to Pacific Ocean and if at all they’re associated then it should be “Eastern” Indian ocean with “Eastern Pacific” ocean so statement 1 should be wrong. Still you’re 50:50 between “B” or “D” unless you’ve exact idea whether El Nino impacts IOD or IOD impacts El Nino and which among them ultimately impacts monsoon? So, guessmaster-giri irrelevant. 1. In India, the Himalayas are spread over five States only. 2. Western Ghats are spread over five States only. 3. Pulicat Lake is spread over two States only. If you apply commonsense that Himalaya ought to be passing through international border states only i.e. J&K, Himachal, Uttarakhand, Sikkim and Arunanchal Pradesh = total 5 states. But we’ve to count the “eastern hills” also, because they’re part of Himalayan system as per NCERT Class 11 India- Physical Geography. So that’d cover Nagaland, Manipur, Mizoram et al so definitely more than five states. Hence first statement is wrong. By elimination we are left with Answer “B”. 1. The source of river Teesta is the same as that of Brahmaputra but it flows through Sikkim. 2. River Rangeet originates in Sikkim and it is a tributary of river Teesta. 3. River Teesta flows into Bay of Bengal on the border of India and Bangladesh. Meaning Teesta merges into Brahmaputra itself rather than flowing into sea by its own. Hence third statement is wrong, therefore by elimination, we are left with answer “B”. 74. If you travel by road from Kohima to Kottayam, what is the minimum number of States within India through which you can travel, including the origin and the destination? Chandipur beach has a unique distinction on its own. Unlike other beaches, the sea water here recedes away from the shore line about five km twice a day, an unusual phenomenon, rarely found anywhere. Therefore answer is “C”. Completely factual one word GK question, so guessmaster-giri is irrelevant and inapplicable here. Yes, some candidates have been circulating youtube clips of Bhavnagar beach with similar phenomenon, but when it comes to UPSC Answerkey, Government site wins over YouTube or Personal travel diary blogs. Difficulty: ★★★ Tough because there is no dearth of such random Kaun Bangega Crorepati (KBC) type GK “Wonders of India”. Tomorrow they’ll ask: “On which beach the blue केकड़ा (crabs) can be seen walking transversly against the orange sunset?” तो साला इतना डिटेल कोन तैयार करता है? And more importantly, will you classify that as geography question or endengered species biodiversity question or biology question about the impact of sunlight on crab movement? Two important rivers- one with its source in Jharkhand (and known by a different name in odisha), and another, with its source in odisha- merge at a place only a short distance from the coast of bay of Bengal before flowing into the sea. This is an important site of wildlife and biodiversity and a protected area. Which one of the following could be this ? Now on this logic, if you start making ‘database’, of all the places asked in last 5 years, and memorize their uniqueness, still cost:benefit will be very less. Because Chandipur has missile testing range, It has devkund waterfall, Nilgiri Jagganath temple- then which king built it during which age? What type of architecture does it have? There is no end to this chain reaction and geometric progression! 48. Which of the following is geographically closest to Great Nicobar ? In नकशा the map, Sumatra seems quite closer to Great Nicobar than Sri Lanka. Difficulty: ★★★ Tough, unless you have the rough idea of the placement of Sumatra, Borneo and Java islands. guessmaster-giri irrelevant. because one word GK answers with close proximity to each other. 4. Mediterranean Sea is a border of which of the following countries? In नकशा the map, you can see Mediterranean Sea doesn’t touch Jordan and Iraq so, by elimination, we are left with answer “C”. Difficulty: ★★★ Tough, unless you have the rough idea of the placement of these countries. Even if you apply guessmaster-giri that (with some background knowledge) that Syria may be touching and Iraq can’t be touching still you’d be 50:50 between “C” and “D”. Besides, above question is factual, with no extreme words. So, irrelevant for guessmaster-giri. PS: There is a fine line between “irrelevant” vs “anti-guessmaster”. GK questions only four options with single words in each e.g. Great Nicobar question given above. Statements not involving extreme words like “all, only, must etc”. Very basic thing which every serious aspirant must be knowing e.g. BOD oxygen. Means UPSC examiner deliberately arranged the options to “lure and entice”- them into ticking wrong option. Example questions: EU’s Global climate alliance, Algae Biofuels etc. Anyways, once I’m done with entire answerkey, we’ll have the larger picture on total number of MCQs in both the sides. Hmm what to say all my answer are correct which are categorized as most tough/ difficult level by mrunal Sir. and most of single star difficult/easy are wrong. How should I prepare??? Sir please review your opinion on IOD. Rajtanil madam and many internet sources show Eastern Pacific along Chilean coast as the other ‘pole’ of the dipole. Just one Hindu reference can’t negate international geographic convention, i hope. Please review the information and let us know your thoughts as there are anyway no demarcated borders between Oceans. Thank you for your untiring work for the common student, You are a legend! You are basically a gifted teacher with a great sense of humour and the knack to explain the most complicated concepts in an easy manner from the exam point of view and i request you humbly to apply your art to as much of the UPSC syllabus as you can, regardless of ‘subject’ or ‘paper’ demarcations, because you probably have the highest ‘impact factor’ among online resources as you cater to hindi and gujrati medium students also simultaneously. Respect. Sir where is the polity part? Your answer key is wrong.I have submitted my arguments yesterday but they have not been allowed. Don’t be fake be real. And publish those arguments. It took me 5 days to go through all answekeys, wikipedia and deep analysis of last 5 years cut off ….I can clearly stat with a lot of confidence that cut off this year will be 103 for general 98 for obc 96 for sc and 92 for st. 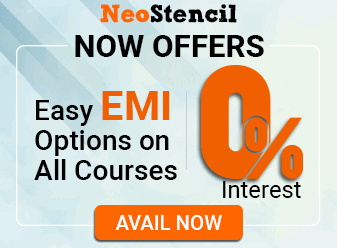 Thanks for the Paper and Analysis.Please also post strategy for 2018 exam. Thanks for the paper and analysis..Please also post strategy for 2018 exam. Bhai.. tum jyada foreteller ho rahe ho!!! Kyu kya tumhare marks isse jyada aa rahe hain? Sir, in butterfly ques ans maybe 1,2,3 ..
sir when will the mains lecture series start?? URL and it’s content can give some idea. how can anthropogenic emissions of carbon dioxide occur in subterranean deep saline formations ? No, NCERT says that Zero tillage and adding gypsum reduces Soil erosion/Soil Conservation, it does not mention about Water Conservation. I agree with you. Rates are commodity based irrespective of quality of produce. Quality here is not about good or bad quality. Quality here talks about the type of rice. Like long rice, short rice types. Mrunal sir, In butterfly- fungus walk question, there was two keywords drastic followed by some. So statement (b) would also be correct. …….Pls Confirm the reliability of the Sources…….these two will be deciding…..
Dear sir, someone has rightly said “jab kisika koi nehi hota, uska bhagwan hota hai” similarly jab kisi aspirants ka coaching k liye high fees nehi hota, uske liye Mrunal hota hai!! You are a saviour of few aspirants like me who can’t afford coaching fees. sir agriculture 21 Q upsc has given option C as correct answer where as in your ‘s it is D. clearify?